Walmart wishes a Happy Mother’s Day to the most amazing moms in the world in a new ad, released in both English and Spanish, highlighting that you can find a perfect gift for your mom at Walmart. 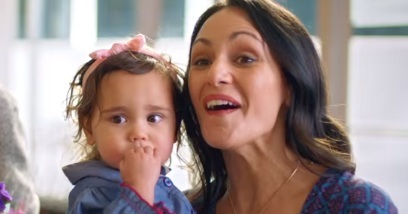 The 30-second spot, set to Bruno Mars’s 2010 single “Just the Way You Are” (from his album “Doo-Wops & Hooligans”), features several moms sharing precious moments with their kids: a young mother gives the goodmorning kiss to her blue-eyed toddler, another mother laughs together with her young daughter in the car, after looking at something on her phone, another mom is dancing around with her twin girls, another one is surprised by her young boy’s gesture of opening the car’s door for her, like a real gentleman, to get in, another one is at the airport with her own family to welcome her mother, who’s visiting, another one helps her teenage son to put on a bowtie, another one is reminded by her son that she has her eyeglasses on her head when she’s trying to read something without them on a phone. with the onscreen line “To the most amazing moms in the world. Happy Mother’s Day”.